Whether you’re a newcomer to the crypto community or a veteran, we all have one thing in common: the critical need for secure storage of our digital assets. At ShapeShift, one of our focuses is on building scalable technologies that people will want to use. But providing an inclusive learning environment where crypto enthusiasts are empowered to transact safely in our world of digital assets is equally important. After all, so many of the resources in today’s cryptosphere make deciding how to store your digital assets complex and confusing. They scare readers with technical jargon and focus on advanced features. We promise you, this guide isn’t like that. There’s no question that the crypto ecosystem presents a myriad of opportunities — and threats — when deciding how you’d like to store your digital assets. But how exactly do you become educated on various options and make the safest, and best choice for you? Keep on reading to understand crypto wallets, or jump ahead to the section that interests you most. 1. What is a Wallet? 2. Where Do I Get a Wallet? 3. What Are the Crypto Wallet Types? 4. Wait — There’s No Chart? 5. Cold Wallets Vs. Hot Wallets: What’s the Difference? A crypto wallet is the technology, either hot or cold, used to hold digital assets. While it might seem obvious to turn to Google for this one, this is a good question because of scammers that have created wallets that look trustworthy but end up stealing. “As bitcoin captures broader interest, this means more people may be purchasing the cryptocurrency, or looking for mobile wallets to store their coins,” the researchers noted. Although there’s no central authority on storing digital assets, we like Bitcoin.org’s “Choose Your Wallet” because most of the ones featured are open source. To store digital assets, you need a wallet of your own. But how do you determine which type of wallet best fits your need? 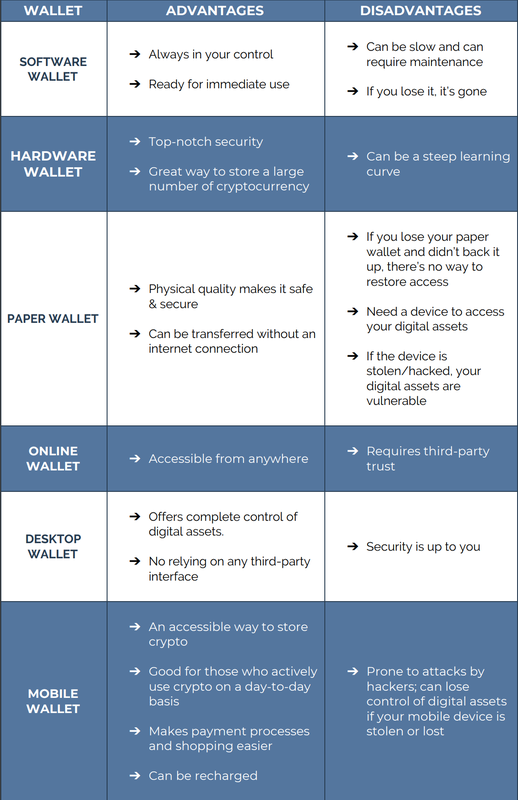 Here’s a broad overview of the 5 wallet types. If you’re serious about crypto, you’ll need a hardware wallet. Hardware wallets allow you to store, receive and send digital assets, making them the complete solution. We recommend KeepKey, but hey — we’re biased. Hardware wallets are also considerably more secure than online wallets, desktop wallets, or mobile wallets. Private keys are stored on an offline device that can be linked to a computer via a USB port. While they are not free, hardware wallets are one of the safest options for anyone that wants to keep their digital assets both accessible and offline. Paper Wallets are where you start with a software wallet or a web wallet and physically print out private part of your wallet and store the piece of paper in a safe place. Your paper wallet is a physical representation of ownership that is on an actual piece of paper. Your public and private key will be written on this piece of paper. Online wallets store your digital assets online through external service that has control of your money. They are cloud-based, meaning you can access them on any device that you can connect to the internet. While this makes them convenient, they are also less secure than other wallet options (these security risks were highlighted during a failed hack attempt on Binance). Desktop wallets are downloaded programs that live on your PC, MAC or laptop. Because a desktop wallet is only accessible from the device that the program was installed to, this wallet type is more secure than an online wallet. Your digital assets will only be put at risk if you fall victim to a virus or personal hack. Mobile wallets are exactly what they sound like — a wallet that is usable via a mobile application. This type of wallet is safer than an online wallet because the data is not stored via the cloud. However, it is considered less safe than using a desktop wallet due to the commonality of losing or breaking a mobile phone. “Cold Wallets” — often referred to as Cold Storage — are wallets that are kept strictly offline. Let’s be realistic — it’s highly inconvenient if you have to scan a QR code, transcribe a key, or plug in your USB cord each time you want to transact. So if you’re someone who makes multiple transactions per day, then you might prefer to store your digital assets on a hot wallet so you can use them at your convenience. Think of this as the amount of cash you hold in your day-to-day wallet. Don’t store so much that in the case that your wallet is stolen, you lose your life savings, but keep enough for a night on the town. It’s 2018; we’re all on the move, and you need access to your digital assets whenever, wherever, you are — and usually, that doesn’t always mean you have your computer on-hand. If this sounds like you, a mobile wallet may be your best choice. Keeping your digital assets secure is top-of-mind. If security is most important to you, keep your digital assets in cold storage. Get a Hardware Wallet. Bottom Line. If you’d like to separate the assets you plan to use immediately and those you would like to store, you can choose to store some digital assets in a cold wallet and your ready-to-use assets in a hot wallet. Different types of wallets have different pros and cons. Now that you understand the basics, you can pick out the wallet that works best for you. There is an ever-growing list of options. Before picking a wallet, you should, however, consider how you intend to use it. Take some time to assess your requirements before choosing the most suitable wallet for you. Happy Hodling! If you’re ready to secure your crypto with cold storage, check out KeepKey. Then, follow ShapeShift.io on Twitter to stay in touch. Want to see more posts like this from ShapeShift? Give this one a clap! 🌲🦊 ShapeShift provides the tools, knowledge & support you need to navigate the cryptocurrency frontier. Subscribe to our emails here: http://bit.ly/2VirtxV. Our newest education, news, and inspiration.